But that might not be enough for fans who are almost as devastated as they were during [SPOILER ALERT] last season’s Red Wedding. 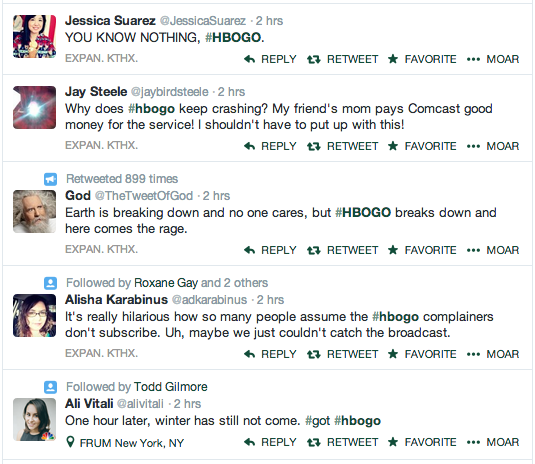 This is not the first time HBO Go has crashed during a highly-anticipated episode. An outage last month during the season finale of “True Detective” caused similar outrage among fans. In fact, some speculated that HBO purposely allows its streaming platform to get overwhelmed to stop subscribers from sharing their login information with non-paying users, which HBO CEO Richard Plepler has denied.